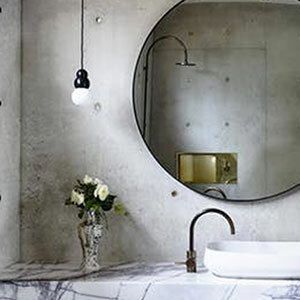 If your bathroom is starting to look at bit sad and soggy, and your shower curtain is more grunge than glam, perhaps it’s time to consider a bathroom renovation. If you no longer take pride in your bathroom and try to spend as little time in their as possible, you should look at what options are available for giving your bathroom a mini-makeover or a full- on renovation, depending on your budget. Bathrooms, like kitchens, remain the most popular improvements, especially since any investment you spend in these rooms is money well spent. If you have decided that something needs to be done, take a look around your bathroom and decide what needs to stay and what must go. Today’s bathrooms don’t need to include a large, space-hogging bathtub – unless you prefer to soak – and you can put any savings you make on leaving out a tub towards a luxury shower. If you prefer to spend time soaking in a tub, shop around for a comfortable, deep tub that really lets you take time out and relax and design the space to let the tub take centre stage. Whether it’s for towels and bathroom necessities, or for storage for a family of four – every bathroom needs storage cupboards, cabinets or a shelf or two. Every bathroom needs storage to corral clutter and bathroom essentials, especially a small bathroom. A bathroom renovation is the perfect time to plan for storage shelves, or to include a bathroom vanity that offers plenty of storage space. You can shop around at stores that specialise in bathroom storage furniture, or you can grab your tools, pop into your local Builders for materials, and make your own bathroom storage cabinets. You’ll find plenty of projects in our Bathroom Craft Section to help you get started and most of the projects we offer can be done by anyone with basic DIY skills. Do be aware of what board products can be used in a bathroom. For example: SupaWood and BisonBord are very absorbent board products and are not recommended for bathroom furniture in a room that is not well ventilated. You can, however, use these board products to make bathroom storage furniture, providing that they are raised off the floor on legs or feet, and properly painted, stained or sealed. I made a ‘his’ and ‘hers’ bathroom vanity a few years back with SupaWood, painted and sealed, and it still looks good today. In a bathroom that lacks natural light or ventilation, enlarging a small window can rectify this, and it works out far less costly than a drastic renovation. You can replace a small, pokey window that doesn’t let in light or ventilation, with a larger window for far less cost than what it would cost to move around or rip out a bathroom – and it will make a huge difference to the room. Alternatively, look at the option of installing a skylight to let in more natural light – without losing any privacy or having to put up with too much mess. Every DIY or renovation project begins with a plan, so take the time to draw up a rough sketch of how you would like to change the layout of an existing bathroom. However, where possible avoid making unnecessary changes to your existing plumbing layout – the fewer alterations you make, the lower your total renovation cost will be. While the cost of renovating a bathroom will vary according to the amount of work required, carefully planning and being able to do some of the work yourself – such as tiling – will save you hundreds of Rands. You can also bring down the cost of a bathroom renovation by shopping around for sanitaryware. Keep your eye out for special offers on designer sets – even if you have to store these for a while until you are ready to begin the project. Planning well in advance means that you have the time to shop wisely, looking at different stores to see the best offers available to fit in with your budget.